Another new species to 365 days is Prosthechea vespa from Brazil. We have seen this species in habitat diring our visits to Brazil in 2000 and 2006 where it was fairly abundant in the forest around Macae de Cima. We found the species growing as an epiphyte in cool humid forests from 1200-1500m and also as a terrestrial especially in regrowth forest (following a fire about twenty years before) where plants have survived and flourished after falling from the dead trees and it seems that the terrestrials make larger stronger plants than the epiphytes, presumably because of increased nutrient and water availability. Eventually these plants will die out as the canopy above them closes over. 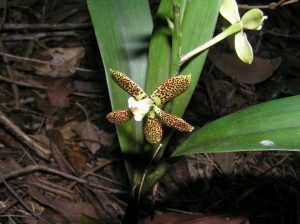 The photo shows one of the plants in Brazilian forest growing as a terrestrial. The flash photograph was taken during daylight and so indicates the shady conditions in the regrowth forest. The varied conditions tolerated by the species in the wild is an indication of its ease in cultivation. We find it grows equally well in Warm Americas and Cool Americas and is not fussy about light level. 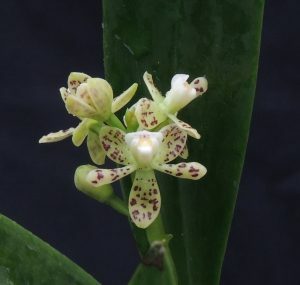 The two photographs show the variability of flower colour and spotting from almost all dark brown to very pale.